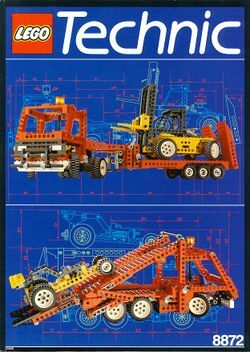 8872 Forklift Transporter is a TECHNIC set released in 1993. It contains 763 pieces. It builds into a semi truck with flatbed and forklift, or a car carrier with dune buggy. The semi truck and trailer features working steering and removable trailer with lowering rear ramp. The forklift features working steering and raising and lowering forks. The car carrier features working steering and a raising and lowering car rack. Facts about "8872 Forklift Transporter"